1 of 3 Heat oven to 350 degrees . Coat the cups of 2 mini muffin pans with nonstick cooking spray (22 per batch). 2 of 3 In a medium bowl, whisk cake flour, cocoa powder, baking powder, baking soda and salt. In a large bowl, beat softened butter and brown sugar until smooth. Add egg and beat until creamy, 2 minutes. On low speed, beat in half the flour mixture, then the buttermilk, followed by remaining flour mixture. Stir in vanilla. Divide batter into prepared pans, about 1 tbsp batter per cup. 3 of 3 Bake at 350 degrees for 12 to 14 minutes. Cool 10 minutes in pans on wire racks, then remove directly to racks to cool. Repeat with a second batch of 22. 1 of 1 While duffins cool, melt butter in microwave, 30 seconds. 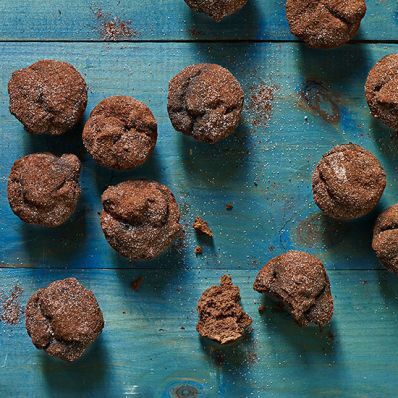 Combine granulated sugar and cocoa in a small bowl. Dip duffin tops in melted butter, followed by cocoa sugar. Serve slightly warm. Per Serving: 1 g pro., 0 g fiber, 9 g carb., 2 g sat. fat, 37 mg sodium, 11 mg chol., 3 g Fat, total, 64 kcal cal.